Honey Boo Boo debuted a glammed-up hair transformation on Good Morning America yesterday. 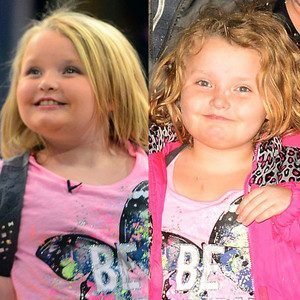 Honey Boo Boo (aka Alana Thompson), 8, flaunted her longer, straighter locks for the cameras as she twirled in front of the studio audience. The young star dressed brightly for occasion with a pink T-shirt with the slogan “Be Happy” written across it, and a sparkly waistcoat. Joining Honey Boo Boo on set was Mama June, who was clutching a can of Mountain Dew. The soft drink is a known ingredients to the controversial Go-Go Juice, that June Shannon was seen giving Honey Boo Boo in an early episode of Toddlers & Tiaras. However, June Shannon has since revealed that she has stopped supplying the drink, and other stimulants – which she once referred to as “pageant crack”. After the appearance, Honey Boo Boo was seen wearing her hair back to it’s shorter and curlier trademark style. Mama June, Honey Boo Boo and the rest of the family have been spending a few days in New York City before the big interview.